Torre Central Manila is a residential and commercial condominium situated along Galicia St. Espana, Manila just across UST. It is a mixed use condominium development ideally a home for the university students for their comfort and accessibility since it is at the center of the university belt. Torre Central has 8 units only per floor. 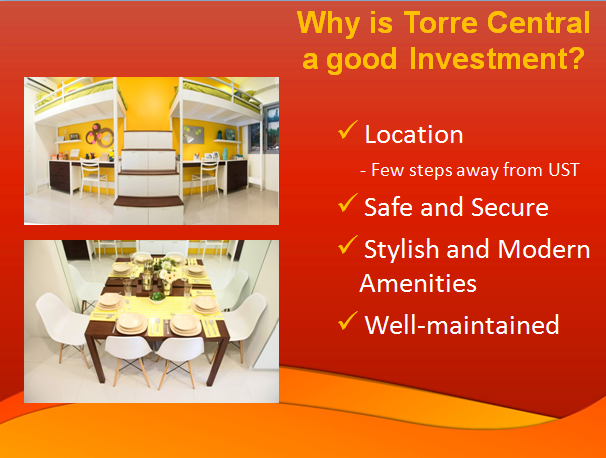 Units at Torre Central offers semi-furnished and fully furnished depending on client’s needs. Torre Central Now Ready For Occupancy. Torre Central is an ideal investment since it is situated from prestigious universities, commercial establishments, hospital, churches and other major establishments. 8% Discount For Spot Cash Payment within 30 days from the date of reservation. 3% Discount For Spot 20% Downpayment within 30 days from the date of reservation. 80% Remaining Balance can be either thru cash or thru bank and In-house financing.